The Pendleton Buckaroos took control early and cruised to a 5-0 girls soccer victory Thursday afternoon in Pendleton. Playing in blustery winds under sunny skies, the Buckaroos were in control from the start. The Cowgirls did have a few scoring opportunities, but each time their shot was either off-line or straight to Pendleton goalkeeper Uliyana Guerrero, who made the stop each time. It was the second consecutive time that the Cowgirls have been unable to score and the third time in their last four matches. 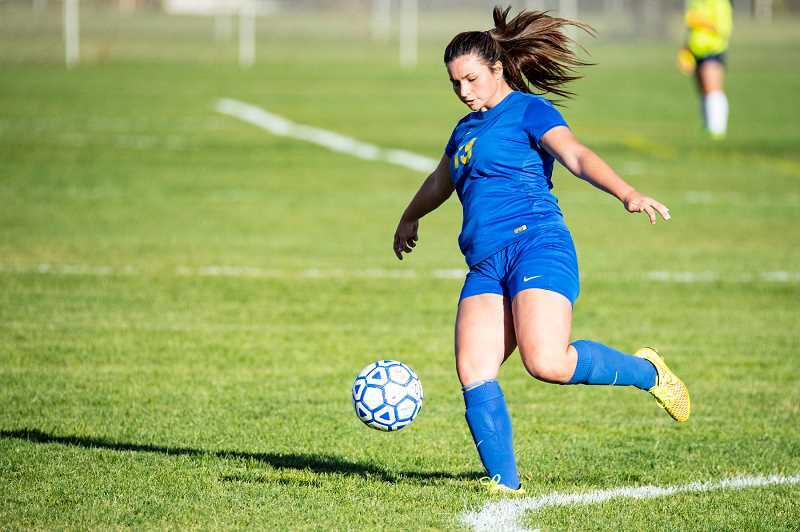 Crook County has not had a serious chance to score since senior forward Gracie Kasberger went down with a season-ending knee injury late in the team's 3-2 loss to The Dalles two weeks ago. With the loss, the Cowgirls dropped to 2-6 on the year and 0-3 in Intermountain Conference play, while the Buckaroos improved to 2-5 overall and 1-2 in league. The Cowgirls are at home today against the league-leading Ridgeview Ravens (3-0, 3-3-1). Crook County returns to the road on Thursday when they take on the Redmond Panthers (1-2, 2-5). Both games are scheduled to begin at 4:30 p.m.